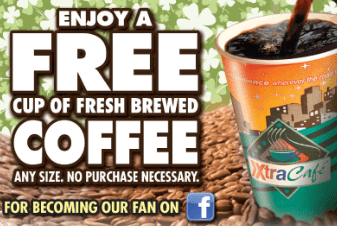 Free Coffee at Xtra Mart Locations Today, 5/20/13! If you live or work near one of the 28 Xtra Mart locations in Massachusetts, you may want to stop in this Monday Morning to grab a free cup of coffee with this printable coupon! There are no locations directly in Boston but you can find a list of all stores here if are a little further out from the city.